Mastering covered call writing requires us to learn from our mistakes and not repeating them. We can then utilize a series of guidelines and rules that will guide us to the highest possible returns with the least amount of risk. Maximizing profits with capital preservation in mind is what the BCI methodology is all about. I have a few questions regarding the Ellman Calculator. Let me give you a recent trade as an example first. On 6/01/2011, I bought 100 shares of GMCR at $80.24 and sold 1 GMCR Jun11 80 Call at $2.90. A week later the price had dropped and I was able to buy back the Jun11 80 Call at $0.27 and sell a Jul11 77.50 Call at $2.77. By the first week of July the price had shot up in the high $80s and I wanted to participate in the gain, so I bought back the Jul11 77.50 call for $14.60 and sold a Jul11 92.50 Call at $1.95. The July 92.50 call expired with the price around $91.00. I then sold an Aug11 95 Call at $4.25 on 7/19/2011. 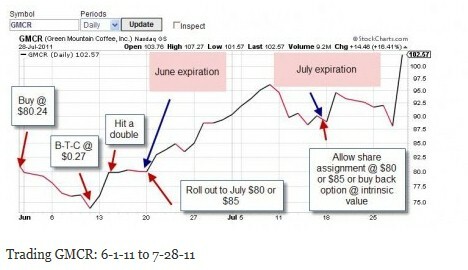 On 7/28/2011, GMCR shot up over 18%, so I bought back the Aug11 95 Call at $11.50 and sold 100 shares of GMCR at $106.06. Initial profit is $2.90 – $0.24/$80.24 – $0.24 = 3.3%. Here we deduct the intrinsic value of the premium and divide it by the initial cost minus the intrinsic value. Good job! Buy back the option @ $0.27 which meets our 10% guideline. Nice work! You rolled down (to the $77.50 call) and out (to the July call), a strategy I never use. You are assuming more obligation on a declining equity (we did not know at that time it would appreciate the way it did but you shut the door on benefiting if it did). Since you were early in the June contract, consider waiting to hit a double you would have! (See pages 259-261 of Encyclopedia for Covered Call Writing). If the share price does not rebound, consider rolling down in the same month or closing the position if the stock continues to decline. Before the lower strike was sold your cost basis is $80. When you buy-to-close (BTC) @ .27 and sell-to-open (STO) @ $2.77 there is a net credit of $2.50. Since the $77.50 call is 2.50 in-the-money, the ROO is 0. Again, I never roll out and down. At this point in time, your cost basis (for purposes of making the best investment decisions, not for tax purposes) is $77.50. You made no money and lost no money on the last trade. Here you rolled up in the same month also a strategy I rarely use for fear of a decline due to profit-taking (after a stock price has risen sharply in a short period of time) and it usually does not put a lot of cash in our pockets. The net debit is (-) 12.65 and the unrealized credit is the current market value – 77.50, probably a wash, again a no-profit trade (but a great learning experience…I’ve been there!). Take a look at this link for the mid-contract unwind, a strategy I developed after I wrote Exit Strategies….This may have been a better approach. It is used when a strike moves DEEP in-the-money and the time value of the premium approaches zero. As we move to the next month make sure the stock still meets our system criteria INCLUDING NO EARNINGS REPORT …uh oh). Now for my most important comment: You sold the August 95 call with an upcoming 7-28 earnings report. Avoid doing this at all costs. Either sell the stock prior to the 28th or own the stock through the report but do not cap it by selling the call. This way you can participate if the report is positive (evidently it was). After the report and the price settles, feel free to sell the call if the stock meets your requirements. You could have sold the stock for $106 without paying the $11.50 to buy back an option you probably won’t sell in the future. Ouch, we had to buy back a call we never should have sold. Many years ago when I first started educating myself on this strategy I did this very thing many more times than I care to think about before I made this rule for myself and now share with you: never sell a covered call option on a stock about to report earnings. The June contracts close right about $80 so we can roll out to the July $80 strike or roll out and up to the July $85. As it turns out the latter would have returned the most but let’s err on the conservative side and say we went with the $80 call and generated another $266 per contract for a final total of $339 + $266 = $605 = 7.6%, 2-month return or 45% annualized. When the July contracts expire, the price is well above the $80 strike or even the $85 strike for that matter. We can allow share assignment and move on to another equity or buy back the option at parity (almost all intrinsic value) and await the earnings results. 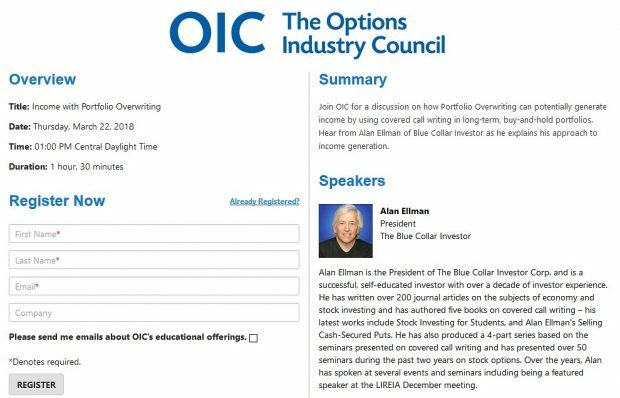 Conclusion: There are so many ways to enter, manage and close our stock and option positions. By analyzing these different approaches and having a complete understanding of the advantages and disadvantages of each, we will all become better investors and ultimately financially independent. ***I will not be presenting live seminars over the summer but will get back into the action in September in Philadelphia. I really enjoy meeting our BCI members as I travel throughout the US. For the week, the S&P 500 fell by 1.4% for a year-to-date return of 15.5%, including dividends. The Weekly Report for 05-31-13 has been uploaded to the Premium Member website and is available for download. Several of the stocks I own in this months portfolio didn’t make your current list. I assume thats because of the market downturn last week and chart technicals. My question is should we move out of the stocks because they are not on the current list. Thanks for your support. 1- You are absolutely right about the reason for the decline in eligible stocks. We’ve seen this pattern time and time again over the years that a decline in the overall market will make it difficult for our screened stock to pass the technical requirements that week…no major issue here as they usually bounce back in normal market conditions. 2- We do NOT use the stock screen as a reason to institute exit strategies. Once the trade is entered, all positions are managed the same way as detailed in my books and DVDs whether they are on the current week’s list of eligible stocks or not. Should we close a position and need a replacemebnt security we do choose from the most current watch list. 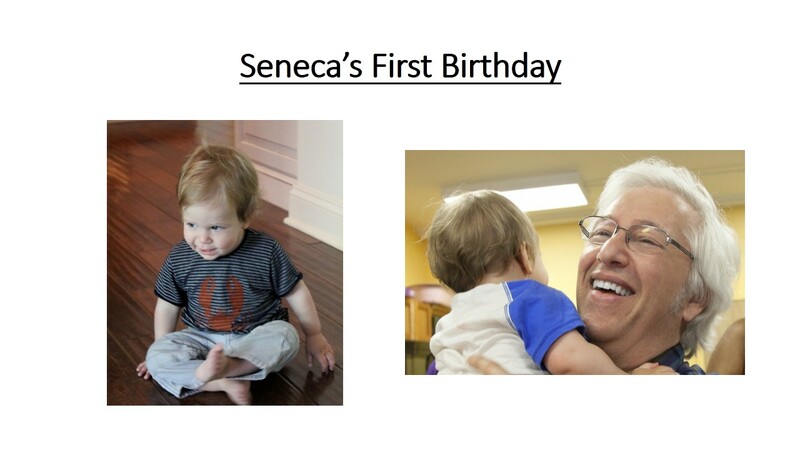 Congratulations on your handsome grandson’s first birthday. Also congratulations, and good luck on your retirement from the practice of dentistry. Thanks very much for your kind remarks and well wishes and thanks to all who sent similar offsite emails. Leaving my patients and staff of many years is difficult making the transition bittersweet but devoting full time to BCI is exciting and invigorating. One of our members purchased CVI (on our premium watch list) for $71.18 and sold the out-of-the-money $72.50 call. A special 1-time $6.50 dividend was announced on May 30th. The stock closed on Friday @ $62.81 and may appear to look like a disaster but it’s not. The $6.50 dividend reduces the cost basis to $64.68 and the strike price to $66. Take a look at the contract adjustment screenshot below. (CLICK ON IMAGE TO ENLARGE & USE THE BACK ARROW TO RETURN TO THIS BLOG). This week’s Report for 05-31-13 has been uploaded to the Premium Member website and is available for download.